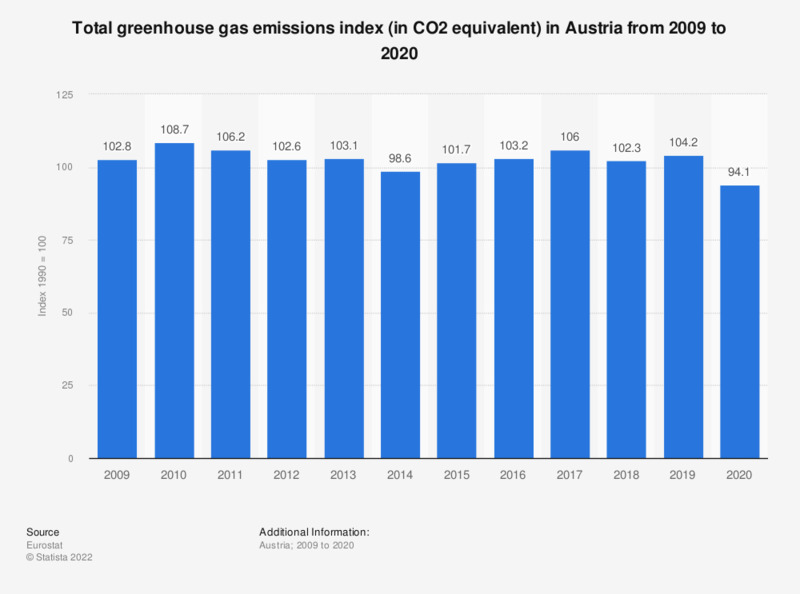 This statistic shows the total greenhouse gas emissions index in CO2 equivalent with the reference year 1990 in Austria from 2005 to 2014. In 2014, the greenhouse gas emissions index was 98.23. According to the source, "this indicator shows trends in total manmade emissions of the ‘Kyoto basket’ of greenhouse gases. It presents annual total emissions in relation to 1990 emissions and also related to emissions in the Kyoto base year. The ‘Kyoto basket’ of greenhouse gases includes: carbon dioxide (CO2), methane (CH4), nitrous oxide (N2O), and the socalled Fgases (hydrofluorocarbons, perfluorocarbons and sulphur hexafluoride (SF6)). These gases are aggregated into a single unit using gasspecific global warming potential (GWP) factors. The aggregated greenhouse gas emissions are expressed in units of CO2 equivalents. The indicator does not include emissions and removals related to land use, landuse change and forestry (LULUCF); nor does it include emissions from international maritime transport. Greenhouse gas emissions from international aviation are not included in the data which is indexed to the Kyoto base year because these emissions are not covered by the Kyoto Protocol. However, they are included in the data indexed to 1990. CO2 emissions from biomass with energy recovery are reported as a Memorandum item according to UNFCCC Guidelines and not included in national greenhouse gas totals."